Unfortunately, I started the New Year off by getting sick. Not the best way to kick off 2015, but luckily I had already started refreshing my home a few days prior. My husband was home, and we kicked it into high gear after getting our Christmas decorations all packed up. I was on a major cleaning/organizing kick, and it was great. I LOVE organizing things--my things, my friends' things, a messy shelf at the store---you name it. My mom says I've been this way my whole life. The trouble is, as with most things we love to do, there isn't always time for it. So when I had a few days to spare over the holidays, I ran with it. Anyway, it was great to conquer so many areas in our home that we'd been putting off. And I really did start my year feeling like I was on top of things! For those of you who don't know where to begin tackling the chaos in your home, I have some tips. Start small. When I started doing my pantry, I started with one shelf. When I saw how great that one was to complete, I moved on to the others. Finishing a project will give you the confidence and desire to move on to another, bigger project. Start with the junk drawer (don't we all have one?) and go from there! The same goes for home decor updates. Dana touched on some great ideas to help you refresh your home, and none of them were too overwhelming. Making a small change in one area will give you the fuel you need to tackle the rest. You just have to start. Make a list. Write out areas you want to improve in your home and then rank them in order of what you'd like to complete first. Start with ones you can achieve NOW and start planning for ones you want to achieve this week, this month, this year. Having everything on paper will hold you more accountable and be a great reminder for your goals. Get to work. Easier said than done I know. But carve out time in your schedule to tackle things on your list. Scheduling an hour or two (or however many you need) on a certain day takes it from a "one day I'll to get to it" project to a "I'm getting to done at 9:00am on Saturday" project. Contact us. If you know you have a room you don't love but have no idea where to start, contact us. We do this for a living and more importantly, we love it. We love making a space come alive. And we want you to love your home! None of this is rocket science, I'm aware. But complex things are conquered with a bunch of simple steps right? One simple step in refreshing a space is painting. We all know that, and we've all heard it time and again. And for good reason. It is so true. But today I'm going to take it a step further and say the easiest way to transform a space is with black paint. Before you all freak out and think my sickness has made me crazy, hear me out. These black hallway walls are the perfect backdrop to make a gallery wall really stand out. 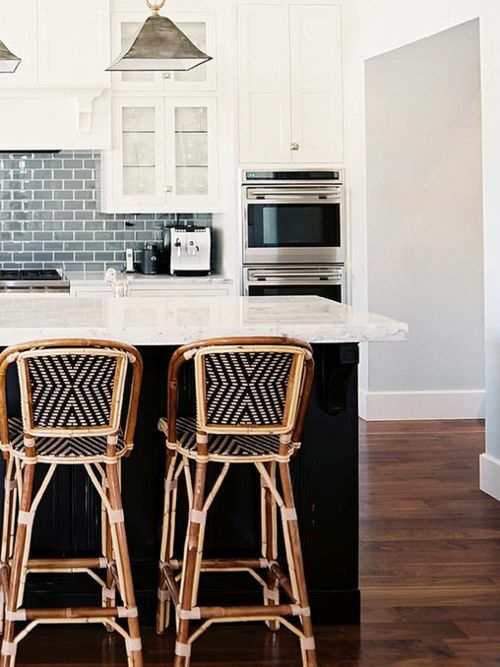 A black kitchen island in a light and bright kitchen...and don't even get me started on those bar stools. This bedroom is amazing on its own but that black ceiling takes it to another level. The entire home, designed by Amy Morris, is stunning. You can see it here. I still need to tackle our front door, but I'd love it to look like this. Who wouldn't want to cozy up with a book in this moody library? Hopefully you're as inspired by black as I am now. If it's still too much, maybe navy or dark gray are your guys. Either way, look for some ways to add contrast to your home in the new year. If you'd love to but aren't sure where or how to begin, that's why we're here! Give us a shout if we can be of assistance in making your home a place you love! Happy belated 2015! Now get to writing those to do lists!